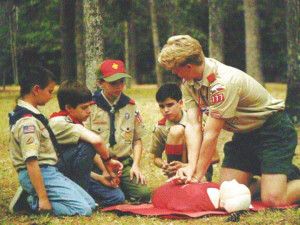 CPR and First Aid Training... for Scouts and Scouters! The American Red Cross has adopted a component system for teaching the CPR and First Aid classes. We use the features of this program to offer a better balance of basic level training. This approach offers those who have taken the class previously an opportunity to take additional training. Scouts working on Merit Badge requirements will also like the new format. The morning session covers the Responding to Emergencies and Adult CPR components. The CPR skills will be taught following the American Red Cross Community Training outline. The videos show realistic scenarios and the class emphasis is on accident prevention. Please remember that advance reservations are required. The scheduled classes fill up fast. Check the Schedule page for current classes. Registration forms are available at the George Strake District Roundtable and can be down loaded from the "Resources" web page. Also check the FAQ page for more information. Get Trained... Keep your training current!